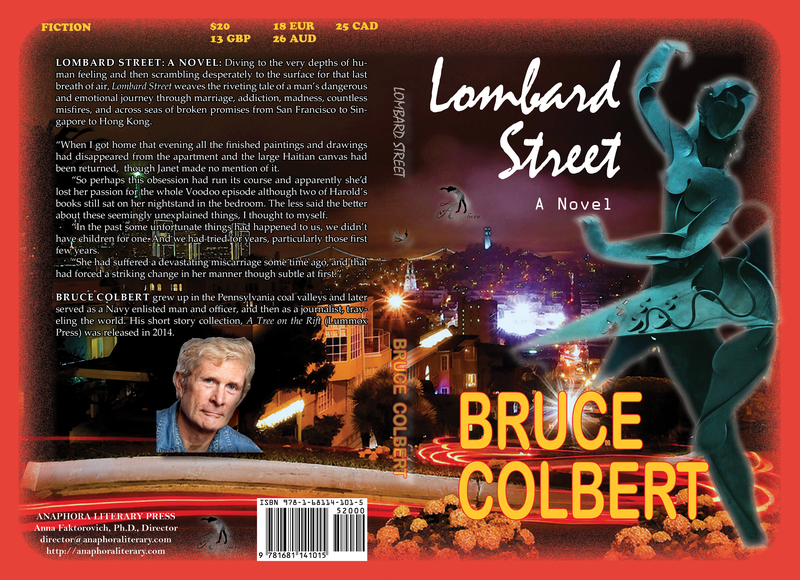 Lombard Street: A Novel: ($20, 218pp, 6X9″, Print ISBN: 978-1-68114-101-5, EBook ISBN: 978-1-68114-102-2, Hardcover ISBN: 978-1-68114-185-5, LCCN: 2015943611, July 2015; Purchase on Amazon or Barnes and Noble): Diving to the very depths of human feeling and then scrambling desperately to the surface for that last breath of air, Lombard Street weaves the riveting tale of a man’s dangerous and emotional journey through marriage, addiction, madness, countless misfires, and across seas of broken promises from San Francisco to Singapore to Hong Kong. “When I got home that evening all the finished paintings and drawings had disappeared from the apartment and the large Haitian canvas had been returned, though Janet made no mention of it. “So perhaps this obsession had run its course and apparently she’d lost her passion for the whole Voodoo episode although two of Harold’s books still sat on her nightstand in the bedroom. The less said the better about these seemingly unexplained things, I thought to myself. “In the past some unfortunate things had happened to us, we didn’t have children for one. And we had tried for years, particularly those first few years. The Race Lost: ($15, 56pp, 6X9″, Print ISBN: 978-1-68114-194-7; $2.99: EBook ISBN: 978-1-68114-195-4, LCCN: 2015948415, August 2015; Purchase on Amazon or Barnes & Noble): Abundantly clear, this passage, begun in youth, and without fear or remorse, traces uncertain human paths like a blind man whose agile fingers uncover all there is to know with the lightest touch. Immeasurably rich, this interpreter offers open wounds and inexhaustible hope. 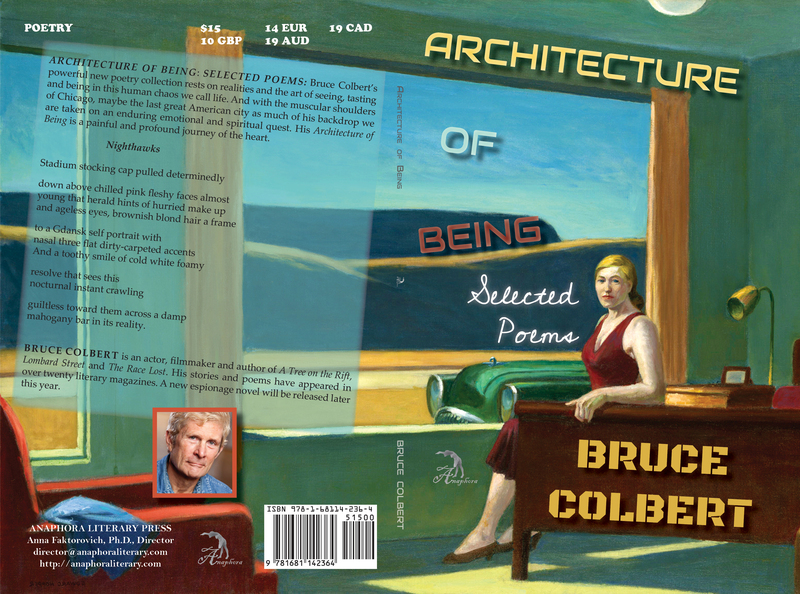 Architecture of Being: Selected Poems: ($15, 80pp, 6X9″, Softcover ISBN: 978-1-68114-236-4, $2.99: EBSCO EBook ISBN: 978-1-68114-259-3, LCCN: 2016901969, March 2016; Purchase on Amazon or Barnes & Noble): Bruce Colbert’s powerful new poetry collection rests on realities and the art of seeing, tasting and being in this human chaos we call life. And with the muscular shoulders of Chicago, maybe the last great American city as much of his backdrop we are taken on an enduring emotional and spiritual quest. His Architecture of Being is a painful and profound journey of the heart. mahogany bar in its reality. The Cairo Arrangement: A Novel: ($20, 238pp, 6X9”: Paperback ISBN-13: 978-1-68114-284-5; $35: Hardcover ISBN-13: 978-1-68114-285-2; $2.99: Ebook ISBN-13: 978-1-68114-286-9; Espionage; Release: September 16, 2016; Purchase on Amazon or Barnes & Noble): This frightening event occurred in present day Egypt. All the case computer files and people have since disappeared. It involved five countries and the world knows nothing about what really happened. An ambitious Air Force commandant, oil-rich Saudis, fearful Israelis, CIA operatives and an Egyptian government, corrupt and avaricious from top to bottom, together fuel the rage and deceit that eventually became the Arab Spring. 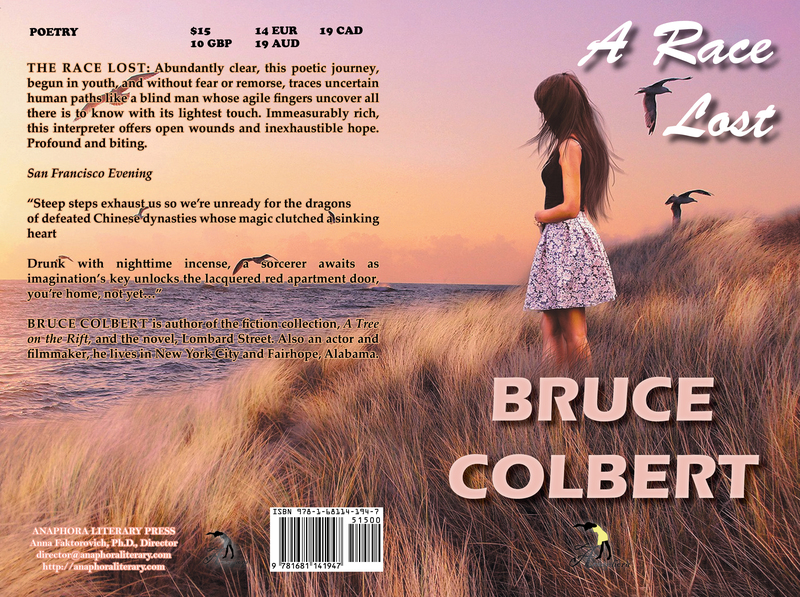 Bruce Colbert is an actor, filmmaker and author of A Tree on the Rift, Lombard Street and The Race Lost. His stories and poems have appeared in over twenty literary magazines. A new espionage novel will be released later this year.